In August 2011 my website was launched and shortly after the Facebook page (EdibleWildFood.com). In this world of social media the pressure was there to get started on YouTube. There were a couple attempts of taping walks I hosted last year but the audio never turned out properly so those attempts came to a halt real quick. When I finally decided to try something else I came to the conclusion that I wanted something a little different. There are hundreds of YouTube videos out there in which the forager is taped and this is good. 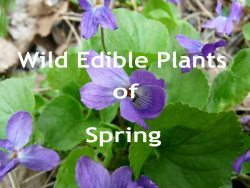 What I felt was lacking was a really good video about springtime wild edibles. Make no mistake, there are some good ones out there but you’re lucky if there are five plants shown, and even then they are not what the plants look like early in the season. Also, I truly want to express my gratitude to Sequoia Records for giving me permission to use the song Sunset Ceremony from the album Sacred Earth Drums by David and Steve Gordon. Brothers David and Steve Gordon came up with a winner when they recorded Sacred Earth Drums, and it quickly became a bestseller. I recommend that you check out all their albums at Sequoia Records. Will there be more videos? You bet. I have lots planned (not just videos) thanks to the amazing help and support I have from my family. Be sure to check out my first video and give it a thumbs up at YouTube! It would also be greatly appreciated if you share the video on all your social media accounts! Thank-you to everyone one of you for your support!